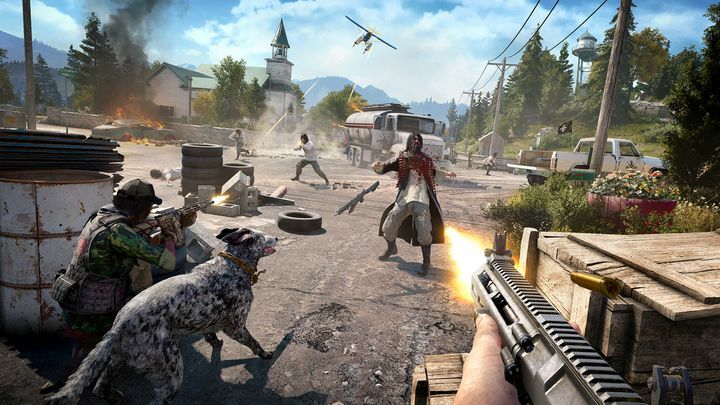 It seems that plenty of gamers are having fun roaming the wildlands of Montana in Far Cry 5, Ubisoft’s latest action game for PC and consoles. Actually, Ubisoft’s recently announced that Far Cry 5 is their second-biggest ever launch after 2016’s The Division. And Far Cry 5’s first-week sales have also dwarfed those of its predecessor Far Cry 4, as a matter of fact the game sold twice as many copies in the same period as the earlier Far Cry game. So it appears players worldwide have really taken to the game’s new Montana setting, and did not miss the exotic locales of previous Far Cry games. Also, the fact Far Cry 5’s protagonist doesn’t say a word throughout the entire adventure is something that has not hurt the game’s appeal one bit either. “We’re grateful to newcomers and fans of the series who have joined us in Hope County [the game’s fictional setting] and have collectively grown our community”, said Ubisoft president Laurent Detoc. Far Cry 5’s director Dan Hay was also happy about the game’s success, saying he’s proud “the culmination of years of passionate work from the team is paying off, and that Far Cry 5’s experience resonates with so many people”. Hay also stated that Ubisoft plans to keep supporting the Far Cry community in the future. Actually, aside from the upcoming release of Far Cry 3 Classic Edition this summer, Far Cry 5 is getting several expansions in the coming months, one of which is set in Vietnam. Also, while it’s posible to play the game’s campaign solo, players also have possibility of fighting alongside a companion in Far Cry 5. Ubisoft revealed that pilot Nick Rye (one of the game’s mayor characters) is people’s favourite human companion, while Boomer the dog is player’s favourite animal sidekick in Far Cry 5’s virtual Montana so far. It’s also interesting to know that almost 100 actors were hired to voice the game’s characters and that the game features almost 75 hours of dialogue, even if sadly none of these are for the game’s protagonist. Aside from sharing this interesting trivia about the game, Ubi also revealed the fact that YouTube videos about the game have gotten more than 100 million views thus far, making it clear that Far Cry 5’s has enjoyed a massively successful launch. So, will Far Cry 5 end up being this year’s most successful game? This remains to be seen, but for now it’s obvious that this is one of the biggest releases of the year thus far, and another good entry in the long-running franchise too.